With summer in full swing, the pool is the perfect place to spend time with not only your family but with your pets as well (they’re basically family too!). 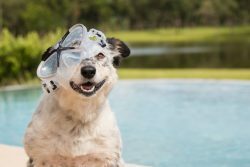 Steer clear of pool dangers with these helpful tips to keep you and your pets safe this summer. If your home has a pool or spa, it is recommended to get a childproof gate to keep little ones and pets safe and away from the water and drains. Drains can be dangerous as they are powerful enough to trap your furry friends underwater, especially breeds that are not strong swimmers. You can eliminate the chances of your companion falling in the water when unsupervised by surrounding the perimeter of your pool with a fence. Not all dogs are great swimmers so investing in a life vest/jacket for your dog is a great way for them to enjoy the water without the worry. Life vests are helpful because they come in a variety of colors and help your pet stay afloat and visible in the water. However, it is important not to rely too much on the life vest and to always keep a watchful eye on your pet when swimming. Did you know that there is such a thing as dog cardiopulmonary resuscitation (CPR)? It’s true and important to know! The ability to effectively administer CPR for dogs is crucial and it could save their lives. If you are not certified and would like to become certified, check with your local shelters and animal organizations to see if they offer classes to teach proper techniques. Summer is the perfect time to get out and relax by the pool. Keep these pet pool safety tips in mind next time you and your four-legged friend want to cool down and take a dip.